Slice of Pi Quilts: Extra! Extra! Read all about it! 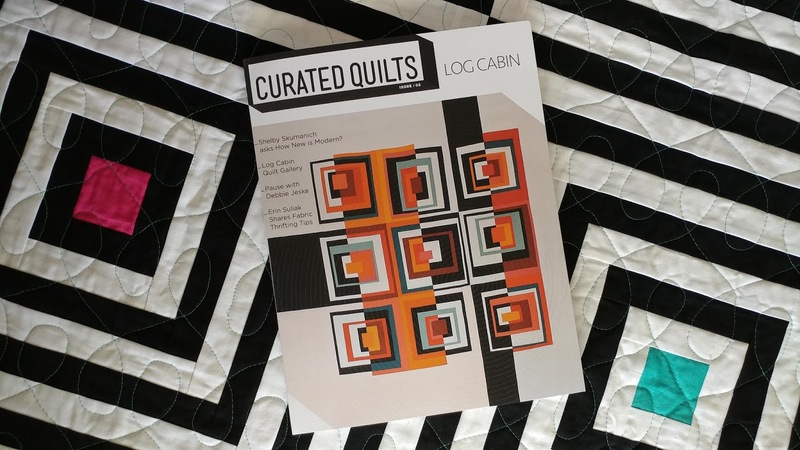 Have you received the second issue of Curated Quilts yet?? The quarterly journal is such a high quality publication. Each issue has a theme, and the curated contents are filled with high profile names in the quilting industry. Each issue has a mini quilt gallery, and I was ecstatic that my linear mini quilt was in the first issue! When the theme of "Log Cabins" was announced for the second issue, I decided to throw my hat in the ring for a chance to have a pattern published. Fast forward a few months, and my "Newsprint" pattern is on page 92! I am so honored to be a part of this publication. The table of contents includes names like Debbie Jeske of A Quilter's Table, Mary Fons of Yo Mary Fons, and Heather Black of Quilt-achusetts. Seriously. I am always picking up magazines and reading their names in them - but to have my name on the same page is mind-boggling! This quilt started clear back in October. I received the email on the 4th saying that it would be in the publication, and they needed the quilt by the 31st! The next two weeks were a whirlwind! Not only did I have to write the pattern, but I also had to make the quilt! 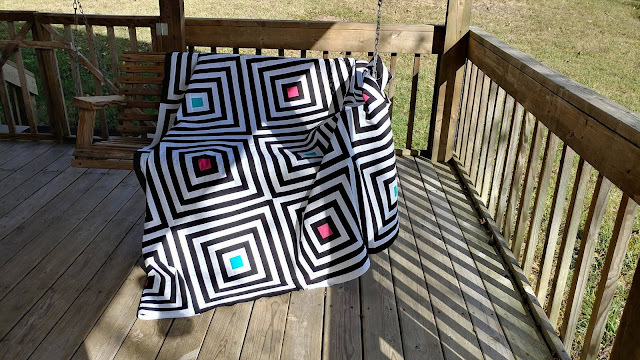 While making the quilt, I couldn't help but call it the "Beetlejuice" quilt! The quilt was large - 72" square. I've never quilted anything that size on my domestic sewing machine (a Juki TL-2010Q), but there wasn't time to send it to a longarmer. I had just learned of a product from Urban Elementz called "Tear Away Pantographs." It is a printed pantograph like you would use on a longarm (and even comes in many of the same designs! ), but it is printed on tissue paper that you baste to the quilt and quilt right over! Then after quilting, you tear away the paper. Urban Elements sent me a few packages of "Modern Twist" to try! I stuck in my spool of 50wt Aurifil Light Jade #1148, and jumped right in! Since I've never quilted a quilt this large, it took a bit of experimenting to figure out how to maneuver it on my machine! 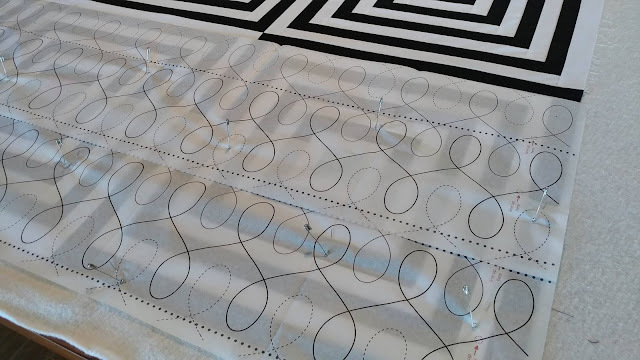 It was super easy to "trace" the lines on the pantograph as I quilted (not so easy to wrangle the quilt!). I started out shaky, and I was worried after all the meticulous piecing that I was ruining my quilt. However, I don't give up, and this was my only chance of getting a longarmed look without a longarm. I stuck with it. By the fifth row, you didn't even notice the ones that were "off" a bit from the beginning. It was all about the overall look. 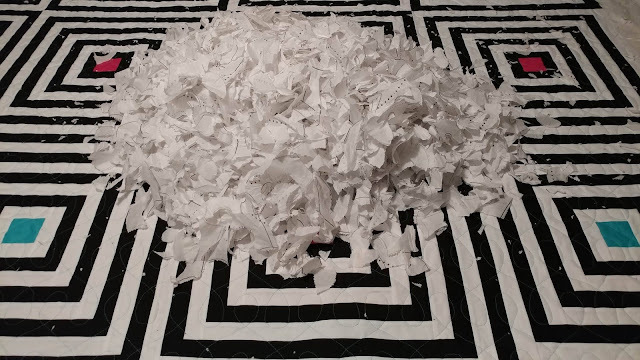 Once the quilting was finished, I bribed my children to help tear away all the paper. I admit, this was more time consuming than I expected. In a dream world, the paper would be "wash away" instead of "tear away," but the quilting underneath was exactly like I imagined it would be! Loops and texture (and teal!) that contrasted perfectly with the black and white lines of the quilt. As a domestic machine quilter, I'm excited to have another tool in my toolbox to use! Urban Elementz currently has 44 of their pantograph designs in the tear away paper. Would you like to try it out? Urban Elementz provided an extra package of the "Modern Twist" tear away pantograph for me to give away! Just leave a comment on this post to be entered to win! (Be sure to leave your email if you're a no-reply commenter. Giveaway ends January 26, 2018, 11:59pm CST.) Giveaway closed. Congratulations, Jane! Although the quilt is far from perfect, I love how it turned out! The illusions of lines not there creates such great movement! Be sure to order a copy of Curated Quilts Issue #2 if you want the pattern! 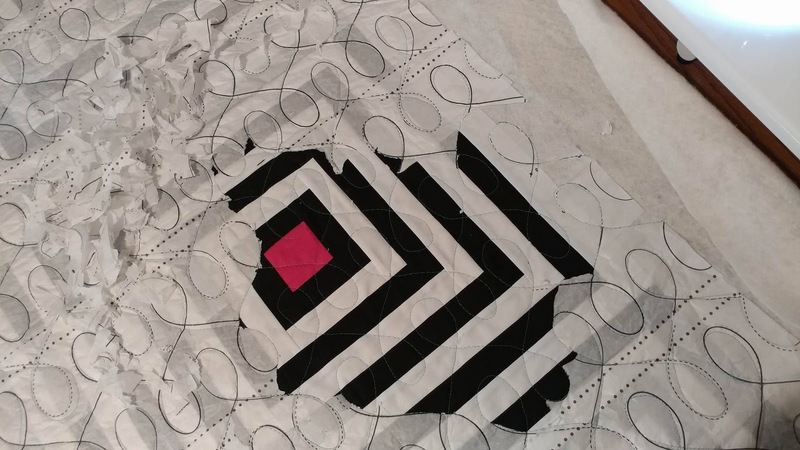 Linking up with Needle & Thread Thursday at My Quilt Infatuation, Finished or Not Friday at Busy Hands Quilts, Finish It Up Friday at Crazy Mom Quilts, Can I Get a Whoop Whoop? at Confessions of a Fabric Addict, TGIFF at Negligent Style, and Friday Foto Fun at Powered by Quilting. I would love a boost in getting me to explore FMQ more! What a fun quilt! Beetlejuice is the perf ct name! What amgreat idea to use the jad colored thread and those pantos look interesting! I wm going to jump over to their website and check them out!! Congrats for all your quilting success qnd yes, now you get your name in the magazines! How awesome!!! Oh my it's stunning! Black and white with a pop of color is amazing, and it even has optical illusions! I wasn't sure about buying the magazine, but I might have to now. Congrats! Your quilt looks wonderful! It would be fun to try the pantograph papers. I've done something similar for a border by drawing my design on tissue paper. Congratulations on having your quilt featured in the magazine. That's no small feat. I liked the results of your quilting; it looked perfect with the boxes. I'm a domestic sewing machine quilter also. I love planning the quilting motifs to be on my quilt. Beetlejuice LOVE!! Good for you to be featured in this great journal. I would love to try the tear away quilt design. I am wondering, by the finish, if you could do this design in your sleep? It works great for this quilt. Nice Work, and thanks! I love your adventurous will try, can do spirit. I enjoy seeing your quilting journey as you are so inspiring. Your quilt is awesome. Love this quilt and will be ordering the magazine.... thanks for a great giveaway. 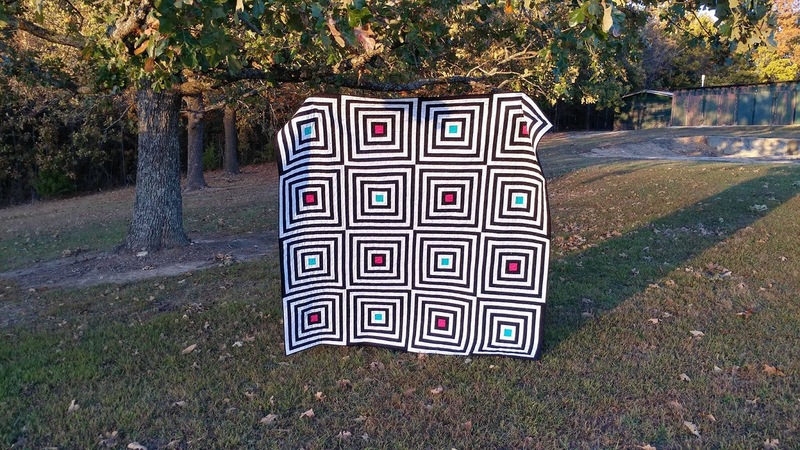 This is such a dramatic quilt, I love it! I would also love to win the panto paper. MY FMQ skills are low and this would be a great way to practice! 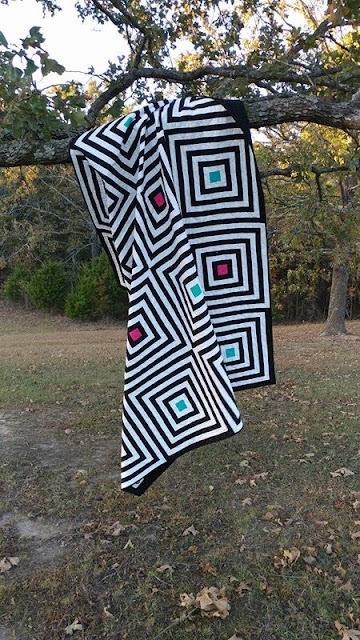 This quilt is a stunner! I love that paper pantograph idea. Going to head over to check some out. That sounds like the perfect quilting helper! Love the optical illusion, and can definitely see the Beetlejuice in it's colors! What a great quilt! Congrats on being in Curated Quilts. I love that panto. (Don't draw my name--it should go to a home machine quilter.) Have you check the used machines page at APQS lately? This is such a great idea! 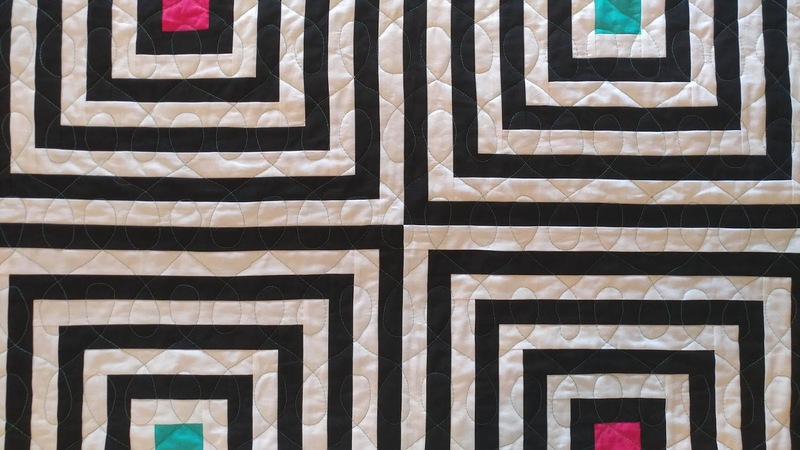 The quilting looks perfect on your quilt and I'd love to try Modern Twist too! I have a "few" WIP that could use it! I had no idea that there were tear-away patterns for quilting. That's so awesome!! Your quilt is gorgeous!! Thank you for the giveaway. Oooh, that quilt is amazing!! I love the black and white with pops of color- perfect choices. Thanks for sharing the pantograph papers with us, I had never heard of them. 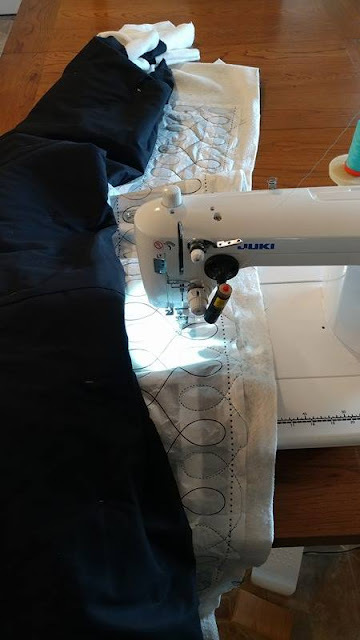 I have a tiny budget and longarm services aren't an option right now. I often sue my Mom's mid-arm machine, but we live 3 hours apart. It would be nice to have a beautiful design I could create on my home machine! Thanks! I'd love to try some of that tissue to quilt an overall pattern. Thanks for sharing the info about the product. Love your quilt! Your quilt is gorgeous! I would love to try out these pantographs on my home machine. What a cool product! This quilt is amazing- love it. 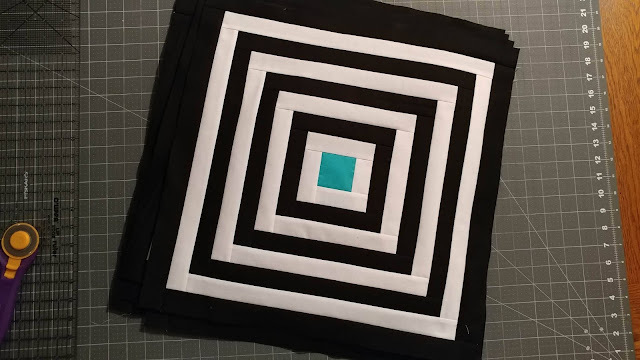 I have not yet tried to machine quilt yet, but would really like to give it a try. Thanks for sharing your creation and offering the giveaway. That looks great, I would love to try it! Wrangling the quilt is definitely the hardest part of quilting on a domestic machine. Would love to try the pantograph paper. Thank you for the giveaway. It is a wonderful quilt. Congrats on getting it into the magazine. I had not heard of tear away pantos. They would be cool to try as I FMQ on my domestic Brother PC6500. Thanks for the giveaway chance. Congratulations Laura! 🎉 Your Newsprint quilt is amazing! I had never heard of tear away pantographs, it is good to know it is an option for beginners like me. Love this new quilt so much! Would love to try the paper pattern for quilting! Congratulations on making such a wonderful quilt and having it accepted into the magazine. I love the whole story. 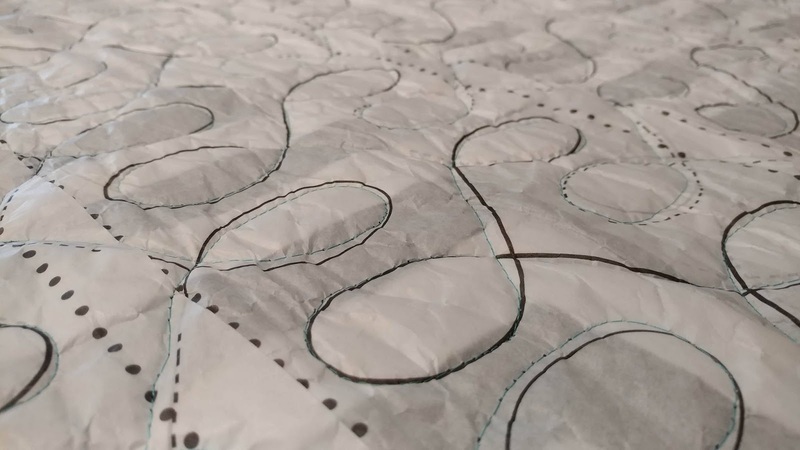 For years, I've traced my patterns onto Sulky water-soluble stabilizer, pinned them to the top and quilted through it. I ususally tear off as much stabilizer as I can before I spritz it. So I'm happy to hear that these are available. Needless to say, I'd love to win one. But I sure will be looking at them for future projects. Thanks for the heads up. That quilt is amaze-balls! Really awesome, and congrats on being published! I would love to try that paper! 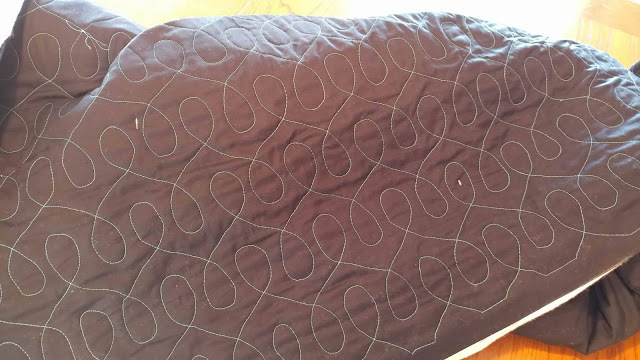 I recently quilted a quilt with the same pattern, no paper though. Mine was very uneven. It still looks OK to me, but yours looks great! Your quilt turned out wonderful. I'd make it in a minute. 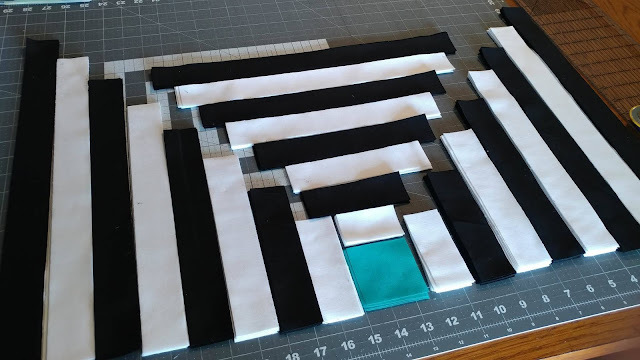 I have tried to fmq loops earlier, but with limited success. I would love to try the panto with the tear away paper. You quilt is fabulous! Congratulations on being published. Would love to try this method of machine quilting. Am having shoulder surgery in a couple weeks so using a long-arm will be out of the question - good time to try quilting on my domestic machine. Great quilt! I just received my Juki and have yet to quilt anything on it. These pantographs look amazing. You did a fabulous job! I love the way yours turned out. I'd love to try one of these pantographs. Your quilt looks awesome! These papers sound like a great way to get the feel of FMQ, which I have yet to try. 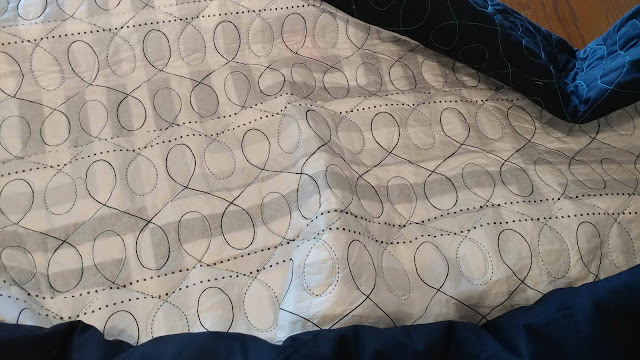 Did you cover the whole quilt with the tissue and then begin the sewing, or did you apply the paper a couple rows at a time? And do you begin at the center of the quilt and work out? Soooo many questions! Thanks for the opportunity to win; would love to give this a try. Congratulations on being selected for the journal! It's so exciting to watch your business take off. Your quilt is absolutely lovely. What a cool quilt! I would never have thought to use teal, but what a great choice! I need to try the tear-away pantos! I would love to try these tear away designs. 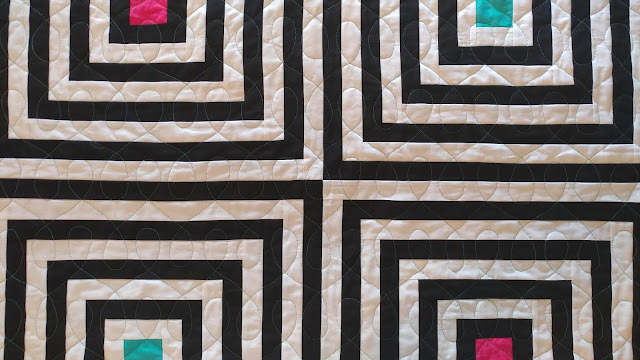 Your quilt is very striking and I like the optical illusion effects. This looks amazing!! Thank you! Your quilt is wonderful! What a great idea. It would be interesting to try the quilting paper. My quilting skills on my sewing machine are limited and this would be a great way to expand them. Congratulations on completing such an awesome looking quilt! 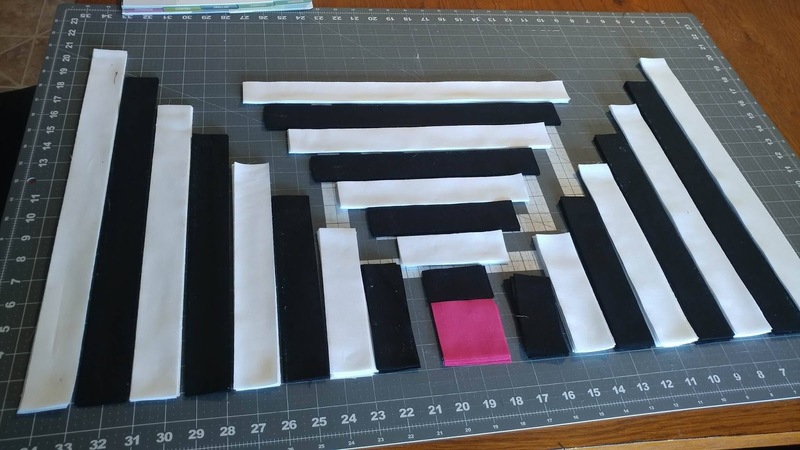 Since I have very little experience quilting on my DSM, those papers sound great. great quilt, really draws the eye. I love the pop of colour in the monochrome. Absolutely love this quilt. And am fascinated by the quilting approach. 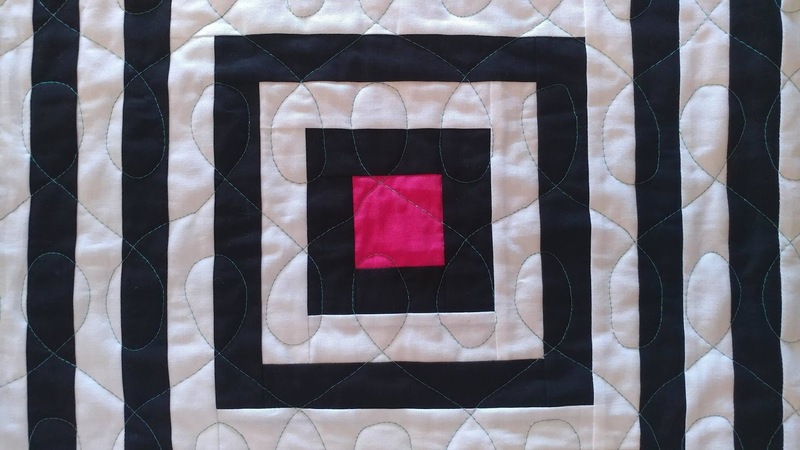 Thanks for sharing a new tool..
Wow, that's an amazing quilt and the quilting is very impressive. 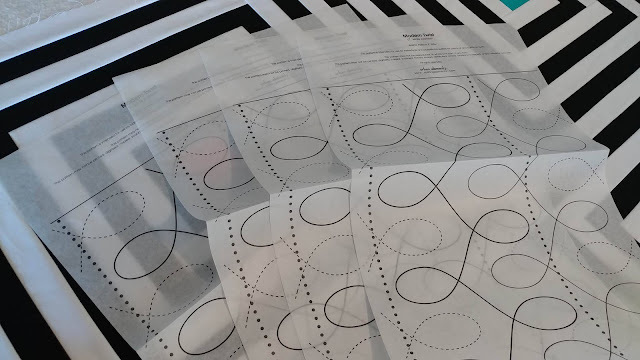 Having once used a wash away marker to try this kind of pattern that paper looks like a wonderful product. Good on you for doing your own quilting too. I'm a domestic machine user too but you lift the bar. Great job. LOVE your quilt!!! Definitely need to track down this new-to-me magazine! What a great way to quilt a top! This tear away pantograph is a great idea and i would love to try it out. Thank you for the chance to win. 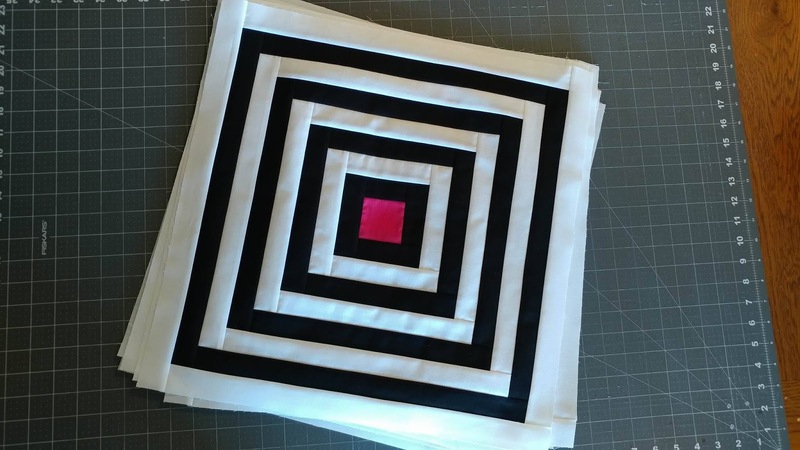 This quilting method is a totally awesome idea! Much easier than marking the fabric for quilting. Thanks! Love this quilt. Thank you for sharing! Your quilt is beautiful! 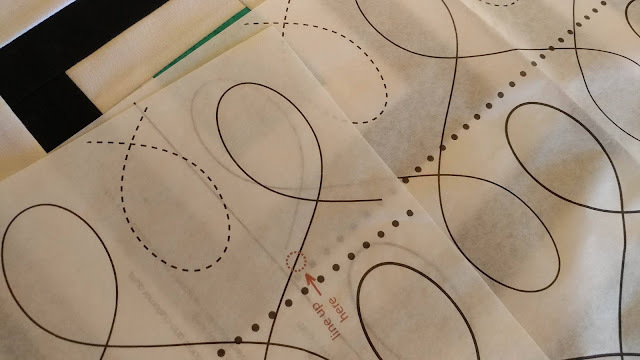 I haven't seen the pantograph paper before and would love to give it a try. What an amazing quilt! Congratulations for being included in the Curated Quilts issue. I have just received my copy and can't wait for some "sit and read" time. Thank you for the introduction to the pantograph paper. I would love the chance to giv ethis a try on my domestic machine. Wow your quilt is beautiful. I would love to make one and hang it next to my black baby grand piano. I like how the pantograph paper worked. Especially nice for a beginner like myself. Off to find the pattern. Thank you for sharing. Awesome design! I love the graphic nature of the quilt with the little pops of color. I have never heard about the pantograph paper, I am going to have to try that out. Congratulations on having your quilt published. You definitely chose the perfect name for it. I've never heard of this magazine before. I'll have to keep an eye open for it. Thanks for sharing about the tear off pantograph paper. It looks like a great product to try. Beautiful Quilt. Good job on your first large FMQ quilt. Would love to try those tear away papers. Wonderfully graphic quilt and I especially LOVE the pops of color!! The NON-longarm quilting pattern is a genius marketing strategy by Urban Elementz. I would TOTALLY go for these papers for an LA look done on a domestic machine!! 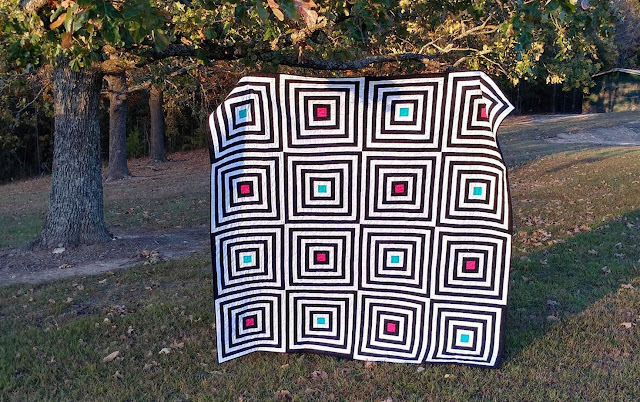 I love this quilt and quilt pattern! So happy I have the Curated Quilts Mag too :D I need to try the panto paper, too. It looks like a great method to get consistency! This looks awesome. I would love to try this. 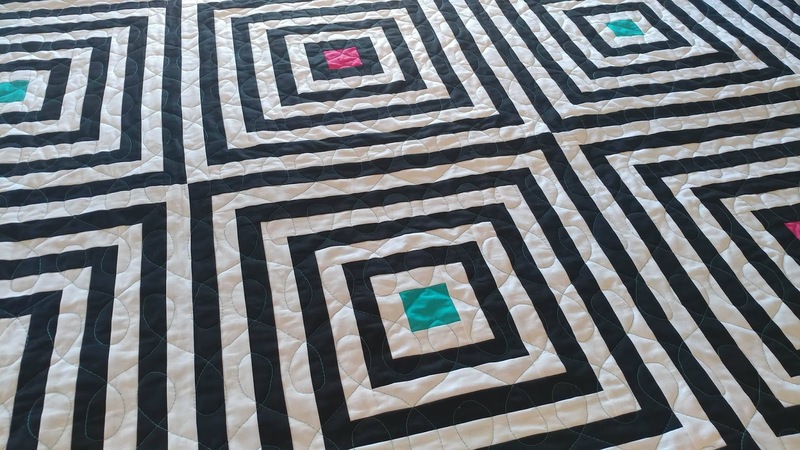 You did a great job of quilting your quilt!!! 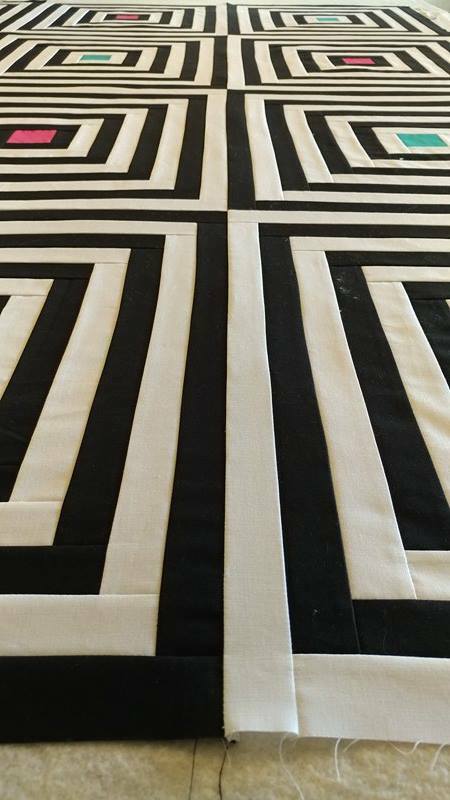 As a long arm quilting teacher for over 8 years, I think you did amazing work and under pressure too! Love your quilt and best wishes for the future!! Your quilt is beautiful! I love that you didn't hesitate to quilt it yourself. 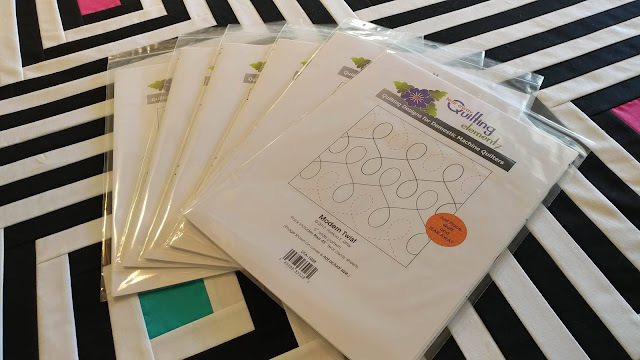 I'm very intrigued with the idea of quilting through a paper template. Imagine the possibilities! Oh, this would really help my quilting anxiety! Your quilt is awesome! And so is the quilting. Thanks for sharing your experiences with pantographs! 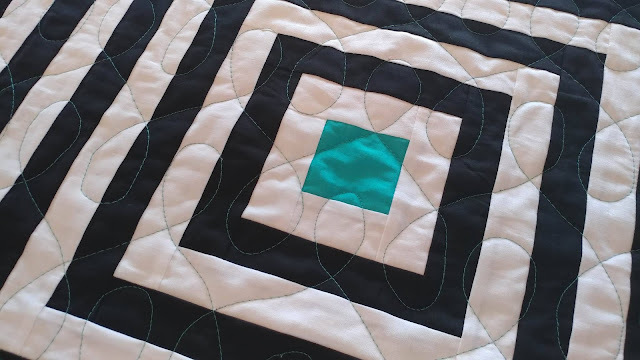 I wasn't familiar with this quilting technique. I'd love to try it.